The system of legates governing the island seems to have been established as a direct result of the Byzantine loss of Carthage in 697. Constantinople was determined not to allow one man to control an entire province in the way that the fairly hapless Gregory the Patrician had with Carthage. 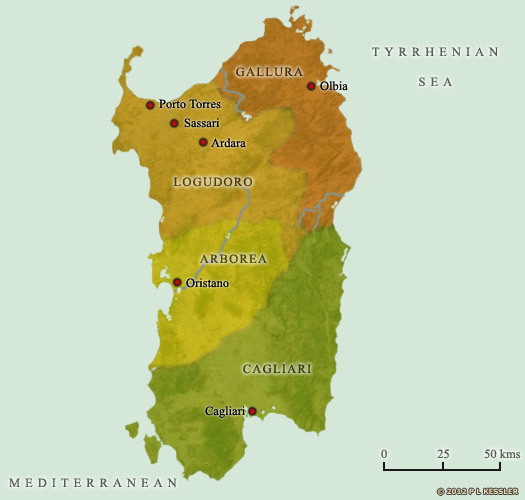 Four legates were established, at Arborea, Cagliari, Gallura, and Logudoro (also known as Torres thanks to its early capital at Porto Torres), and their administration became increasingly independent during the ninth century. Logudoro was located in the north-western corner of the island, with a tendril reaching the island's centre. It was neighboured to the east by Gallura, to the south-west by Arborea, and to the south-east by Cagliari. All details about the giudici until the beginning of the twelfth century are hotly disputed by scholars. First giudice of the House of Lacon Gunale. Also in Arborea. Gonario of Torres is the earliest-known of the giudici of both Logudoro and Arborea, although the giudici have presumably been in office since about 697, and independent since the mid-ninth century. Gonario's double office raises the suggestion that the two positions have been united under a single ruler for a certain period. The giudici of Gallura emerge just a few years afterwards. Gonario makes his capital at the Phoenician-founded town of Tharros, although it is unclear whether he is the first to do so. Comita I could be Gonario I, also known as Comita. Died. The earliest-known giudice of Cagliari emerges into history, approximately a generation after Arborea. Son of Gonario? Former giudice of Arborea. Died. Upon the death of Comita II, Barisone hands Arborea to his relation, Marianus, and assumes control of Logudoro. 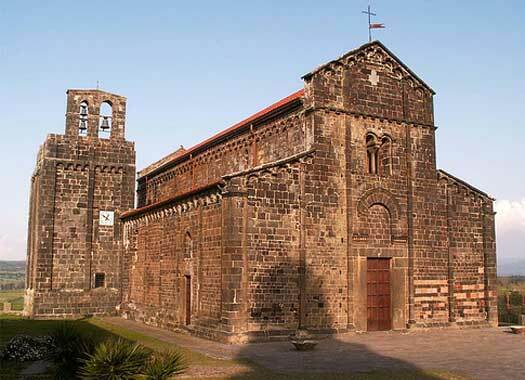 Very quickly, in 1063, he asks Desiderius of Benevento, abbot of Monte Cassino, to send twelve monks to establish a Benedictine abbey on Sardinia. 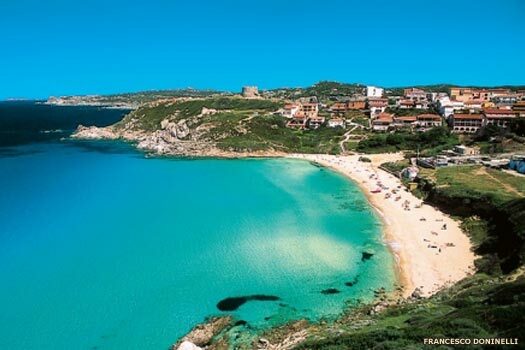 However, the archdiocese of Pisa is determined to retain its religious monopoly over the island, so the monks are attacked at sea off the coast of the island of Giglio. Four of them are killed and the others return to Monte Cassino. Pope Alexander II excommunicates the Pisans for the assault, and in 1065 two more monks are sent. Barisone gives them Santa Maria di Bonarcado and Sant'Elia di Montesanto. Son or nephew, and selected successor around 1064. Although Andrew Tanca has been the selected successor of Barisone I since about 1064, and has been associated with him in the governance of Logudoro, it is Marianus of Arborea who succeeds Barisone upon his death. This constant exchange of Arborea for Logudoro would seem to mark out the latter as the post of higher prestige on the island. Son or nephew of Barisone. Former giudice of Arborea. Together with Comita of Gallura and Constantine of Arborea, Gonario swears fealty to the archbishop of Pisa. Three years later Pope Innocent II divides Sardinia between the two sees of Genoa (newly created) and Pisa. Naturally this creates a further excuse for warfare between the two great rivals but, on the island, only Comita of Gallura supports the Genoese. There is a break in any records concerning Comita II of Arborea during this period. One theory for this is that he is usurped by his brother, Torbeno, during a war against Logudoro. His death soon after his apparent restoration in 1145 sees his son replace him, soon after which Barisone also gains control of Logudoro. Casting aside Pellegrina de Lacon, his wife of the Sardinian nobility, Barisone marries Agalbursa de Cervera, the niece of Count Raymond Berengar IV of Barcelona. The marriage is the seal on an alliance with Barcelona, which also represents the first Iberian influence on the island. Barisone fights the Balearic Almoravids on behalf of Barcelona and Raymond Berengar supports his attempts to unite Sardinia under his rule. Barisone II of Arborea claims Cagliari as his own, probably through his mother, Elena de Orrubu, who would seem to be Constantine's daughter. He seizes Cagliari from Constantine's successor, Peter, and holds onto it for about a year. In 1164, Peter and Barisone II of Logudoro unite with the Pisans (their traditional allies) to recapture Cagliari and then invade Arborea, and Barisone of Arborea is forced to seek refuge in Cabras Castle. Son. Died without a male heir. Ubaldo II of Gallura extends his power over Sardinia still further. Thanks to his marriage to Adelasia, daughter of Barisone III, when her father dies, she inherits his office as giudicessa, and Ubaldo is perfectly placed to dominate both her and Logudoro. Husband and dominant ruler. Giudice of Gallura & Cagliari. Upon the death of Ubaldo, Adelasia quickly marries Enzo, the son of Holy Roman Emperor Frederick II. Ubaldo's will specifies that his cousin, John, is to be his successor in Gallura and, although this occurs, John is nothing more that a titular giudice. True power is seized and held by Enzo, although perhaps only briefly before John asserts himself. Second husband. Son of HRE Frederick II. Effectively partitioned in 1259, Logudoro does not re-emerge into independence. Instead, part of its territory is ruled by the Genoese families of Doria and Malaspina, while the rest is absorbed into Arborea. The city of Sassari, Logudoro's last capital, becomes an autonomous city-state.